This second section describes Precambrian rock exposures, as well as the atmosphere, climate, and Precambrian life. Many illustrative pictures are included. Design examples and creationist ideas are interspersed throughout. The third section provides two perspectives suggested by creationists: (1) a young universe and life and (2) old inorganic material, but young life. 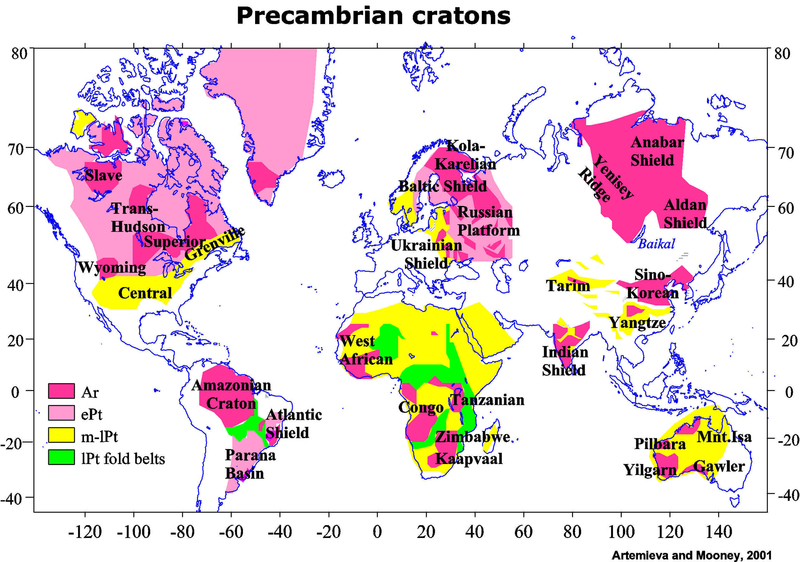 Large areas of Precambrian cratons are exposed in what are called shields in Australia, the central part of Canada, western (Fig.1) and central Africa (Fig.2), the Baltic region (Fig.3), and major parts of China, Brazil (Fig.4) and Argentina, and India. 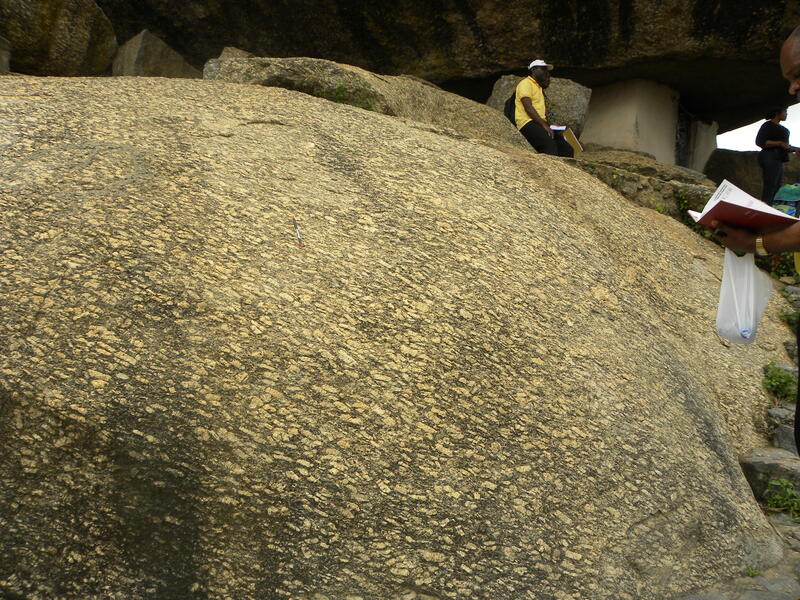 FIGURE 1: The 0.7-0.5 Ga granitic Olumo Rock, Abeokuta, Nigeria. FIGURE 2. 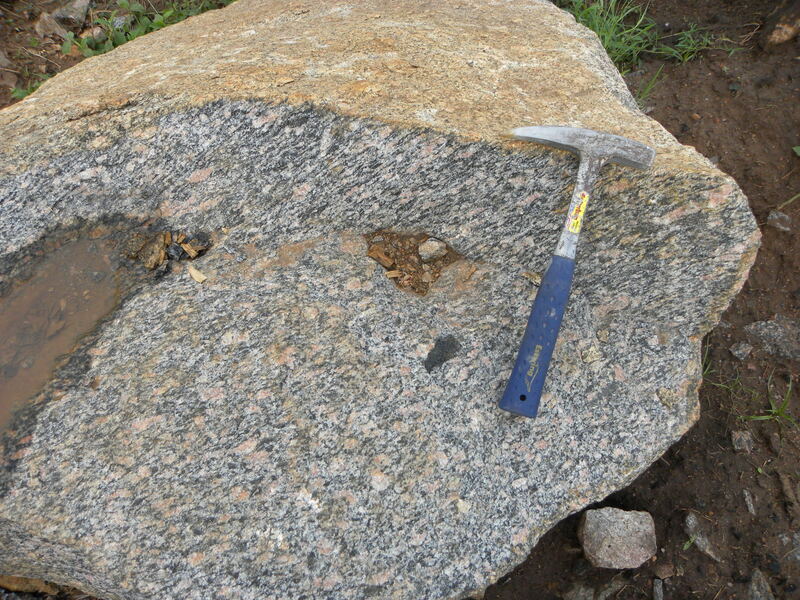 Banded granitic gneiss containing pink potassium feldspar minerals located north of Kampala, Uganda. 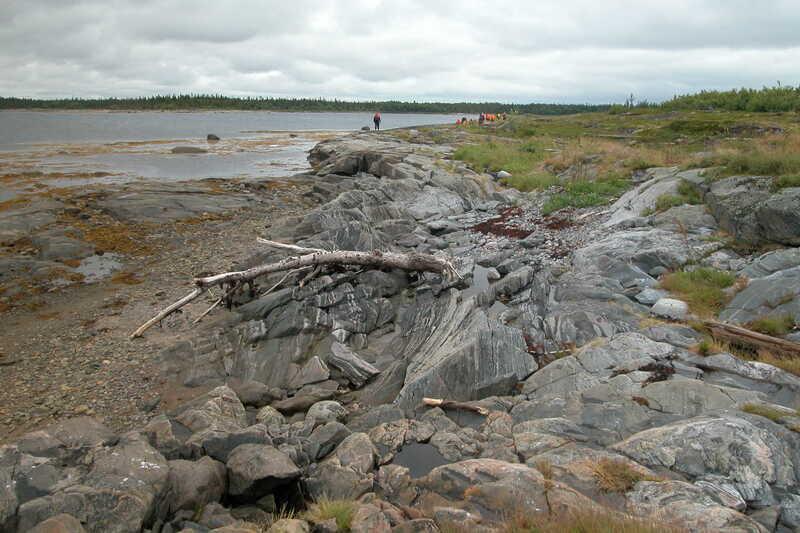 FIGURE 3: Metamorphic banded and folded 2.7 Ga gneiss on Stolbikha Island in the White Sea off northwestern Russia. 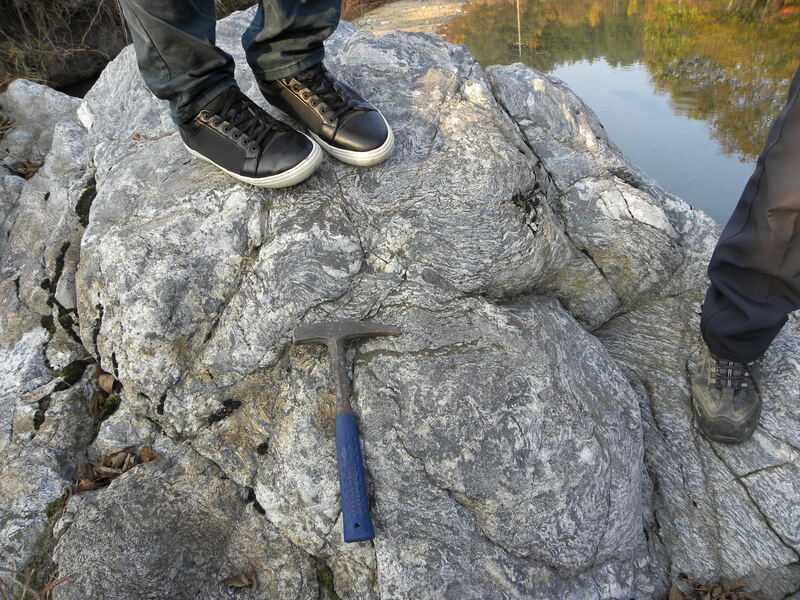 Many small outcrops of Precambrian rocks are exposed as basement rocks in other parts of the world such as Korea (Fig.5), Peru (Fig.6), Mt. 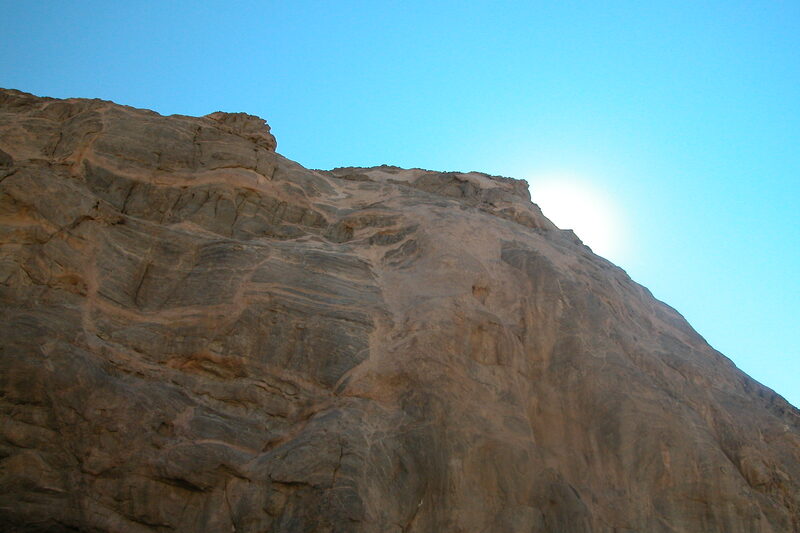 Sinai (Fig.7), and southern Israel at Timnah (Snelling, 2010). Outcrops in the United States are found in places like northern Michigan, the bottom of the Grand Canyon, the Colorado Rocky Mountains (Fig.9), New Mexico (Fig.10), and the Transverse Ranges of southern California (Fig.11). Some of the first cratons to form at about 3.3 Ga were the Kaapvaal and Zimbabwe (Fig.12) cratons in southern Africa and the Pilbara and Yilgarn cratons in Australia. Some of the other three dozen cratons include: the Slave and Superior cratons in Canada, three in Greenland, and cratons in Scandinavia and the Antarctic. FIGURE 6. 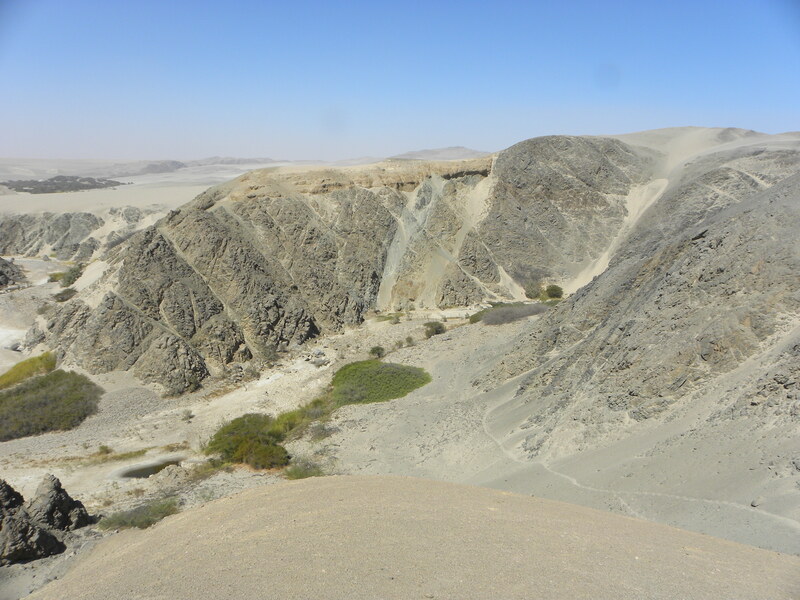 Canyon in Precambrian gneiss, south of Ocucaje near Ica, Peru. Our rubidium-strontium data suggest that these rocks may have an isotope age of 2.5 Ga. FIGURE 7. 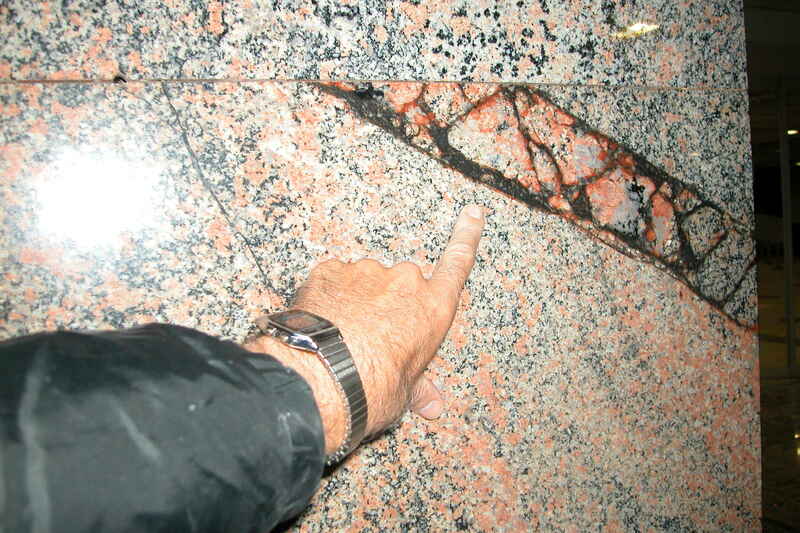 Mt Sinai granite with an age of approximately 1 Ga. See general information by the creationist, Andrew Snelling. FIGURE 8. 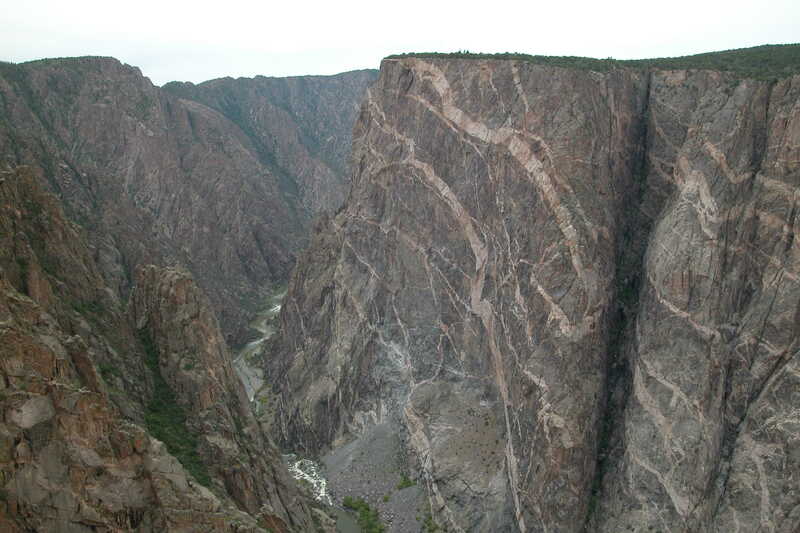 Gray 1.7 Ga metamorphic gneiss and schist in the walls of the Black Canyon of the Gunnison, Colorado. The rocks formed during the collision of an ancient volcanic island arc with the southern part of the Wyoming craton. 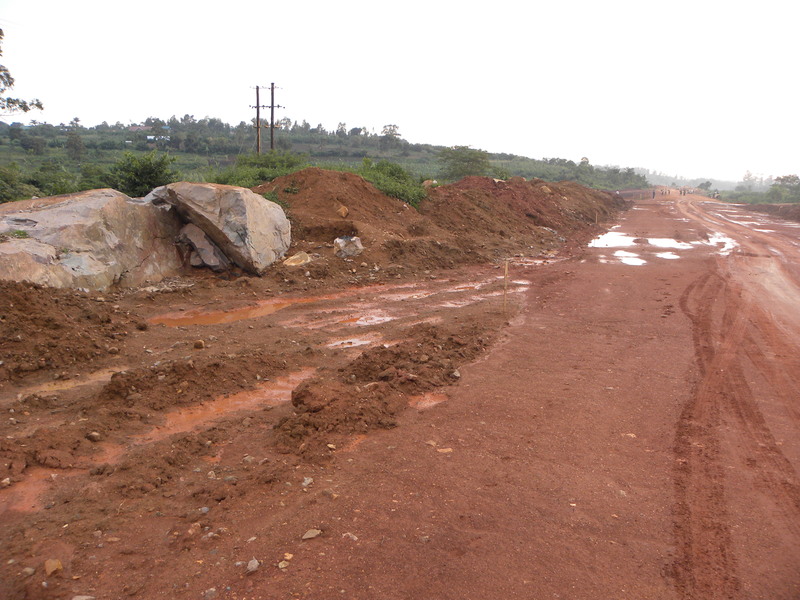 The lighter-colored Vernal Mesa granitic (quartz monzonite) dikes were intruded into cracks at about 1.4 Ga. Slow cooling allowed large crystals of pink potassium feldspar to form. (Matthews et al., 2003, p.53). FIGURE 10. 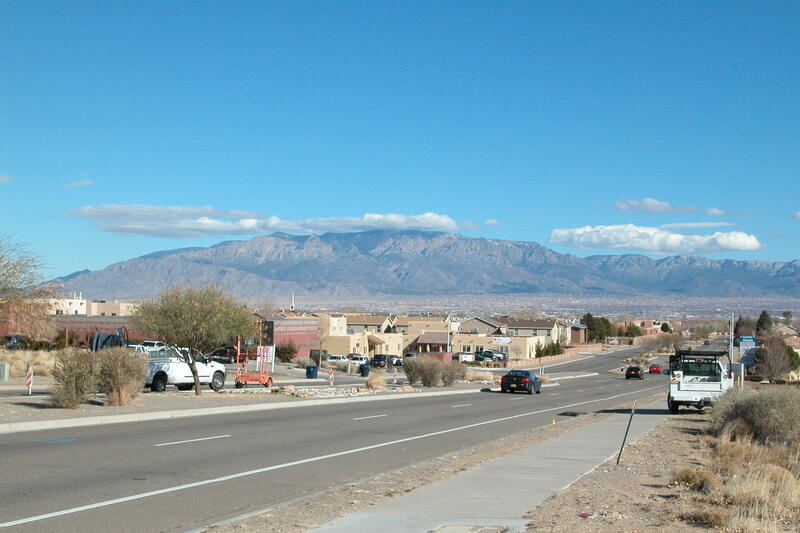 Sandia Mountain near Albuquerque, New Mexico. Figure 10: The 1.4 Ga Sandia granite shows pink potassium feldspar that can be used for radiometric dating. FIGURE 11. 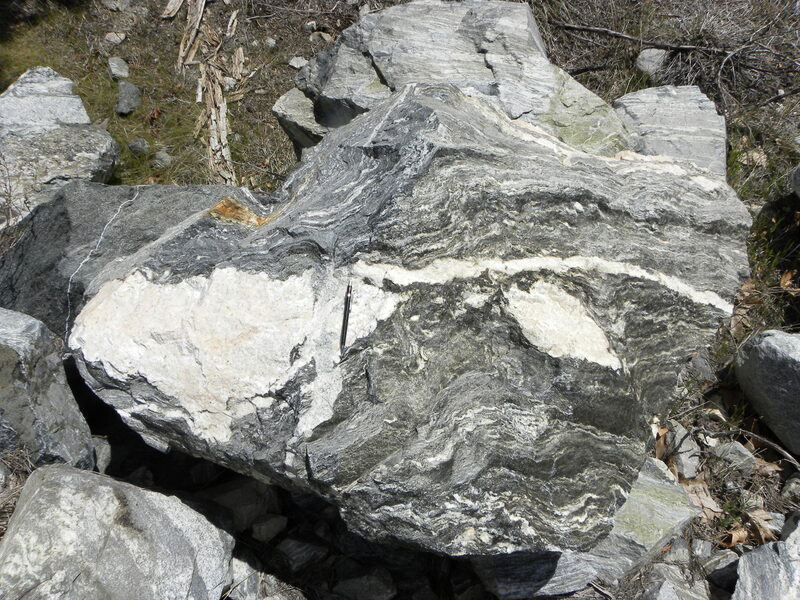 Metamorphic 1.7 Ga Baldwin banded gneiss near Forest Falls in the San Bernardino Mountains of southern California. (Barth et al., 2000) Note pencil for scale. FIGURE 12. 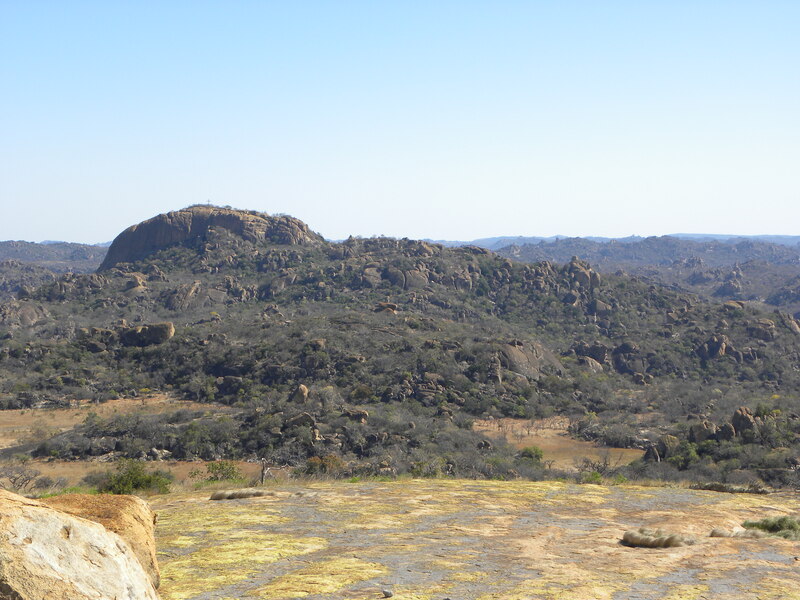 Precambrian (2.6 Ga) granitic rock of the Zimbabwe craton as seen from Cecil Rhodes grave in Matopos National Park near Bulawayo, Zimbabwe. FIGURE 15. 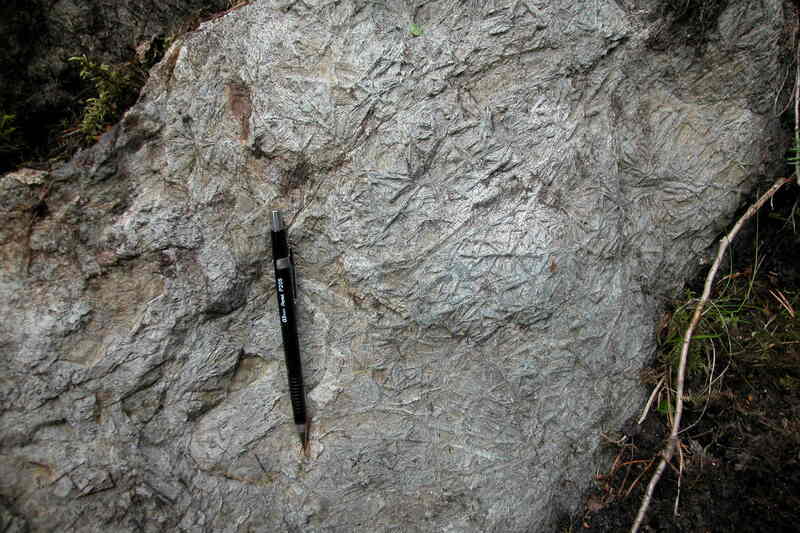 Pillow lava structures (with surficial glacial striations) in metamorphosed volcanic basalts of the approximately 2.7 Ga Mona Schist greenstone belt west of Marquette in the Upper Peninsula of Michigan. Granitic magma was intruded underground to form chambers as in Namibia (Fig. 18), to break up the host rock as in eastern South Africa (Fig. 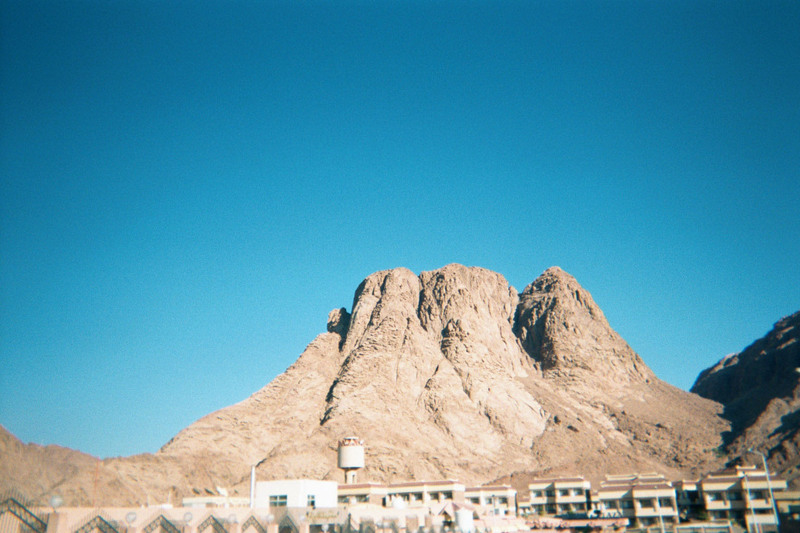 19), and to mix with host rock as near Cape Town (Fig. 20). 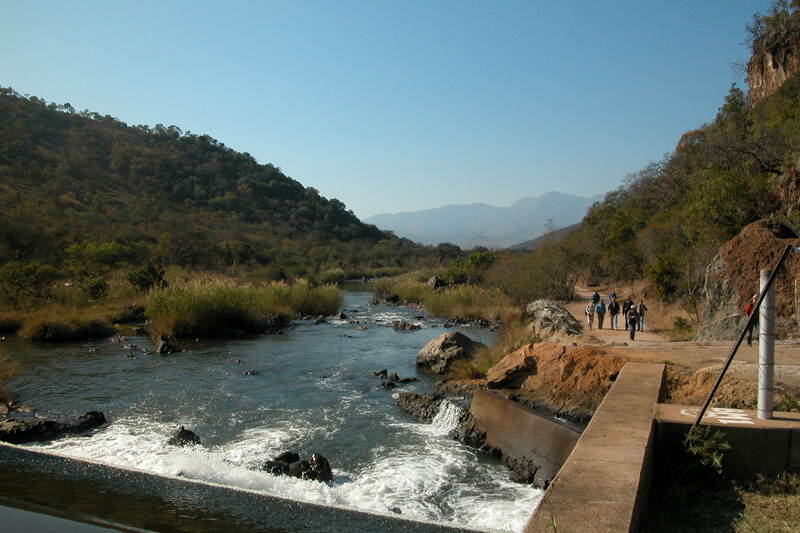 Igneous, magmatic activity associated with craton movement produced large dikes of low silica rocks such as the Great Dyke in Zimbabwe and layered igneous intrusions such as the Skaergaard in Greenland and the Bushveld Complex in South Africa that are important sources of platinum group elements. 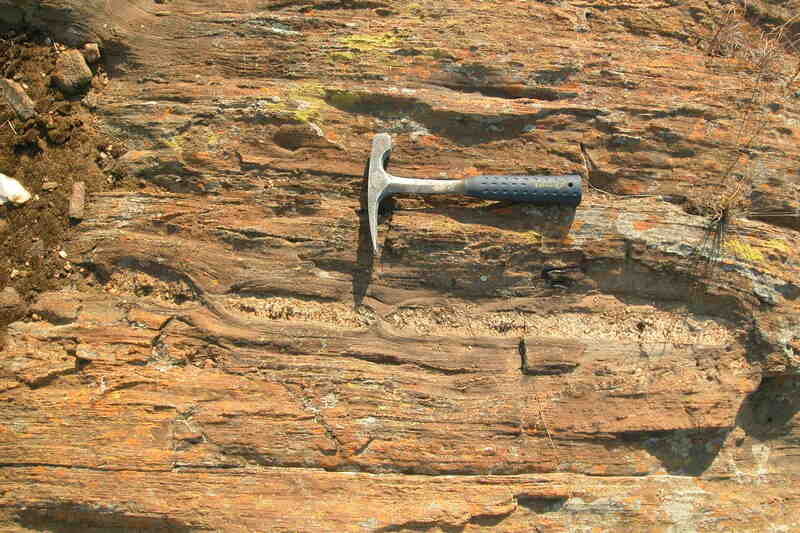 Metamorphosed sediments include sandstone, limestone, and shale, with turbidites in South Africa (Fig. 21) as one example. 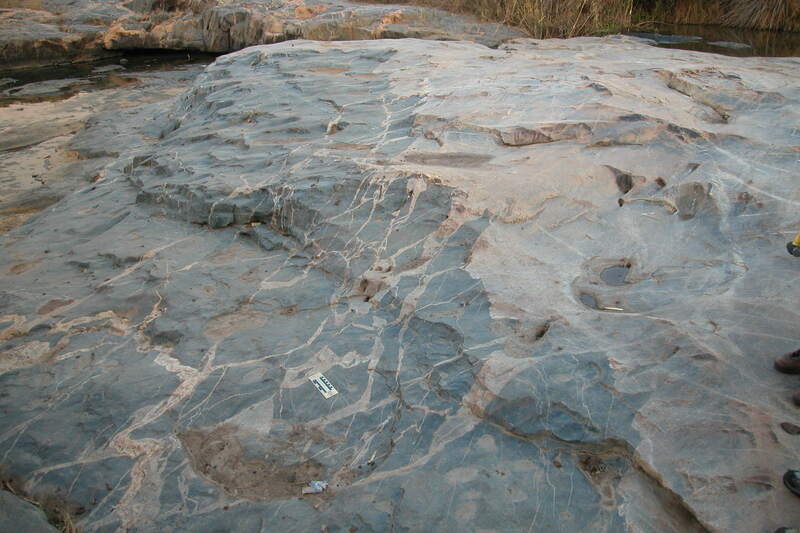 Other examples of fold belts include: the several 0.9-0.5 Ga Pan-African fold belts in Zambia (Fig. 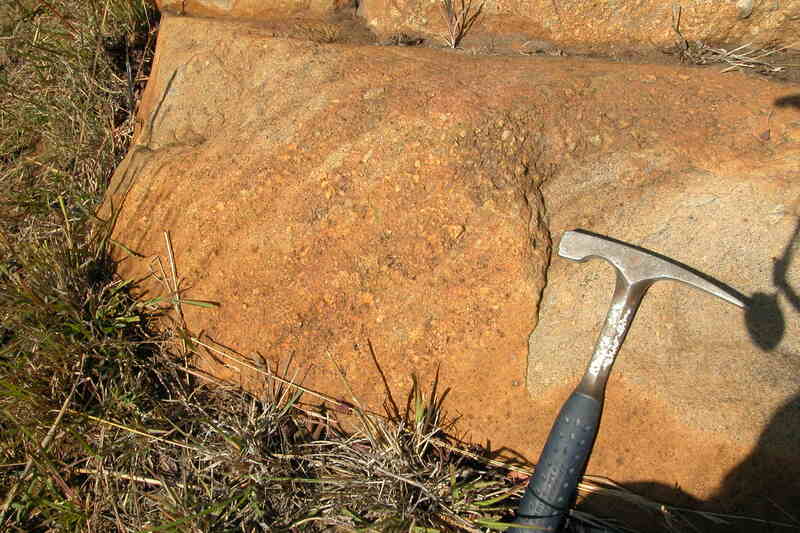 22) between the Congo and Zimbabwe cratons that are a major source of copper, the 3.5-3.2 Ga Barberton granite-greenstone complex in South Africa between the Zimbabwe and Kaapvaal cratons that displays greenstone rock (Fig. 23), and the 3.8 Ga Isua Greenstone Belt in Greenland that is one of the oldest. FIGURE 20. The Cape Granite Suite (pink) intruded the 0.8-0.6 Ga Malmesbury metamorphosed sandstones and slates (black) at about 0.63 Ga as seen at the Sea Point contact, Capetown, South Africa. The white spots are feldspar crystals. 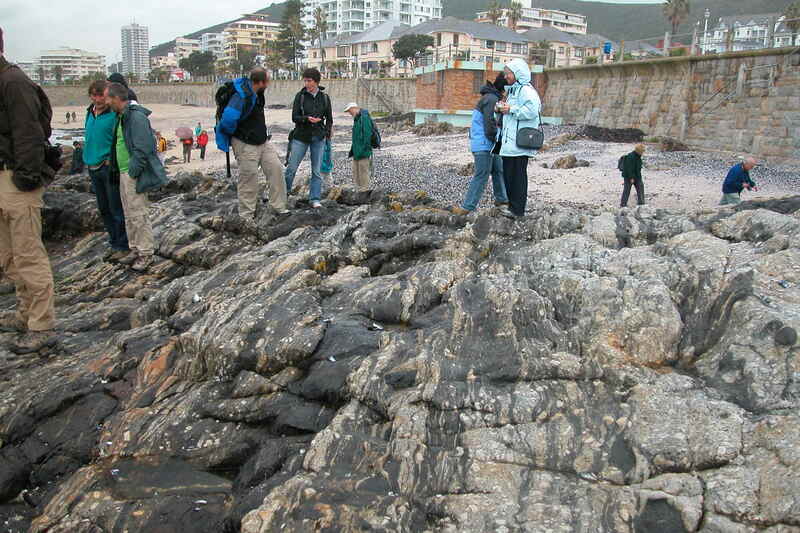 After cooling and uplift, the granite and metamorphic rocks were eroded to a peneplain on which the Ordovician Cape Supergroup was deposited that now forms Table Mountain. The Sea Pont contact was made famous by Charles Darwin’s observations published in 1844. For more information, see University of Cape Town and the creationist, Tas Walker. FIGURE 22. 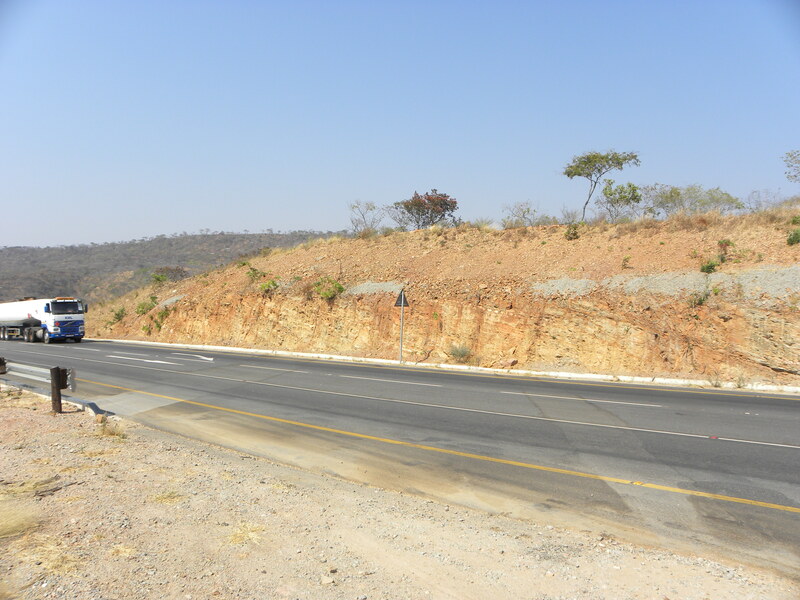 Metamorphosed shales and sandstones appearing as schist and quartzite in a roadcut of the Munali Hills southeast of Lusaka, Zambia. 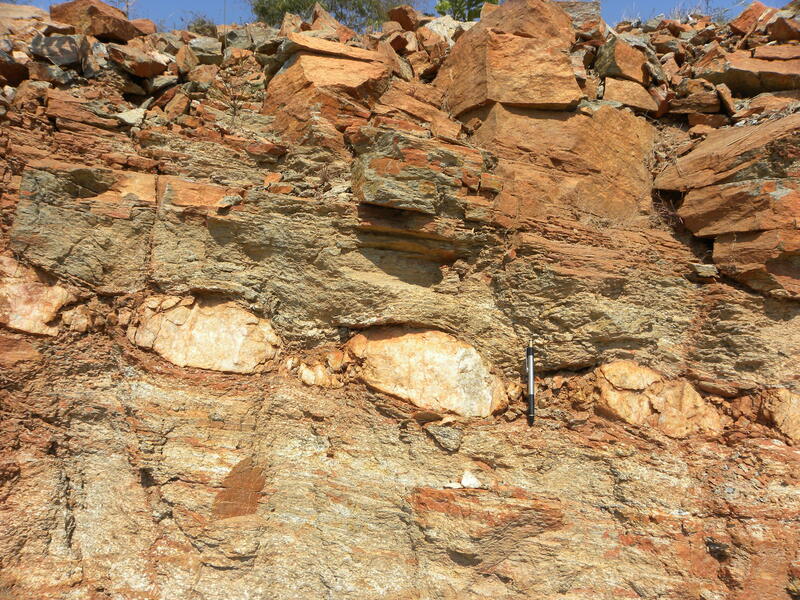 This 1.1 Ga Nega Formation is part of the Zambezi fold belt between the Congo and Zimbabwe Cratons. Numerous impact structures are found in the Precambrian such as the large Vredefort Dome (Fig. 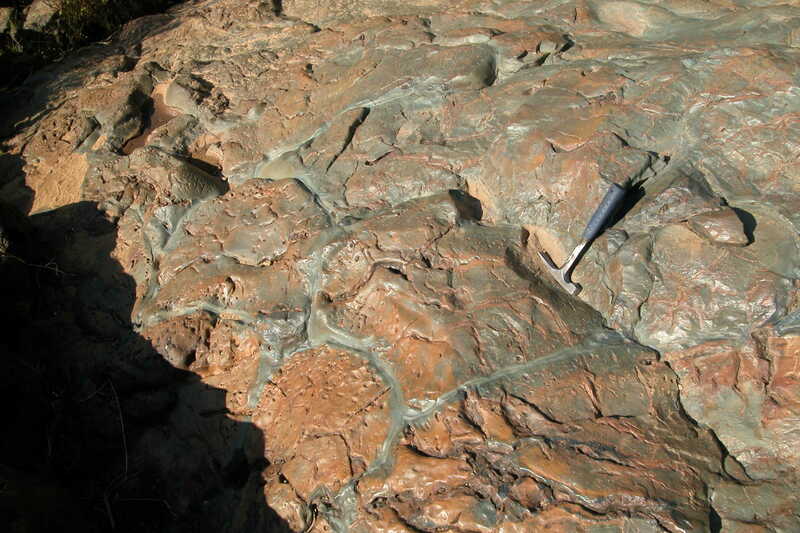 24) in South Africa formed at 2 Ga and the Sudbury structure in Ontario, Canada formed by a 10-15 km bolide at 1.8 Ga. 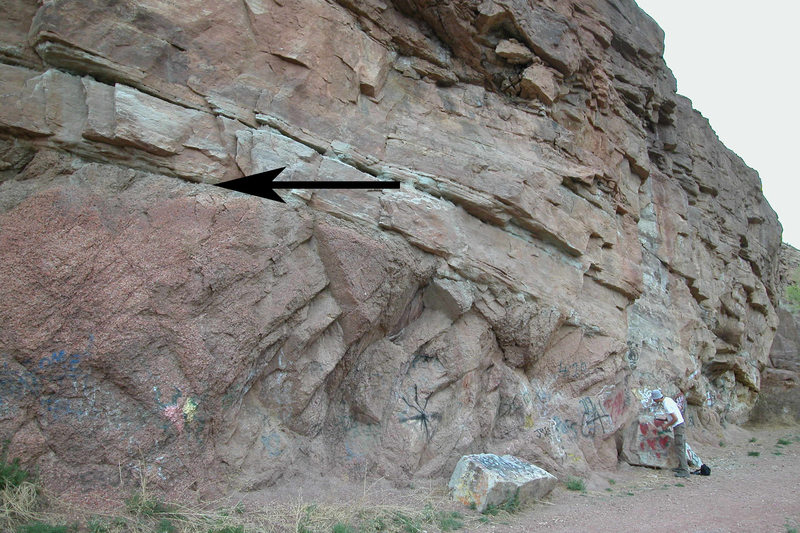 In many places an unconformity exists between the Precambrian rocks and the fossil-bearing Cambrian sediments above them, e.g., in Colorado Springs (Fig. 25). However, in a few places the unconformity in the sedimentary record may be lacking, e.g., in Morocco (Schmitt, 1978) and Newfoundland (Hutchinson, 1962; Narbonne et al., 1987; Brasier et al., 1994). FIGURE 25. 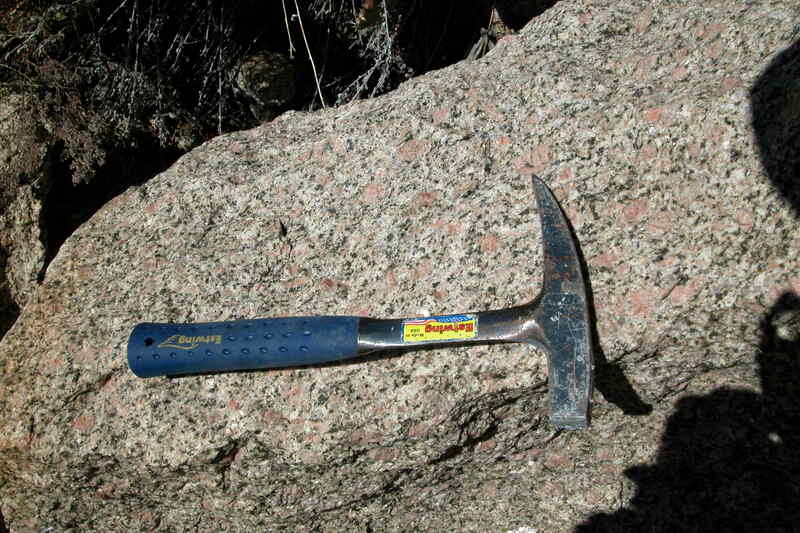 The unconformable contact (arrow) between the 1.1 Ga Pike’s Peak granite below and the horizontal Cambrian Sawatch Quartzite above is located near Colorado Springs, Colorado. FIGURE 26. 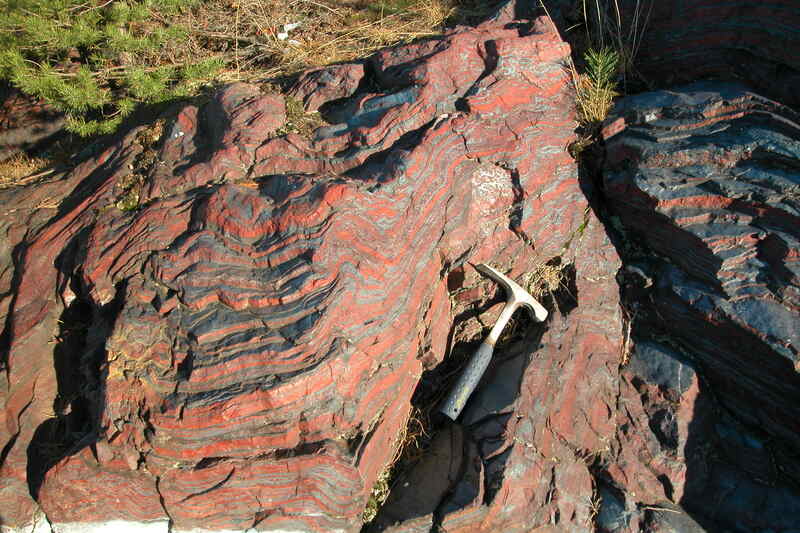 A banded iron formation (BIF) of the Negaunee Iron Formation located at Jasper Knob, Ishpeming in the Marquette District of the Upper Peninsula of Michigan. 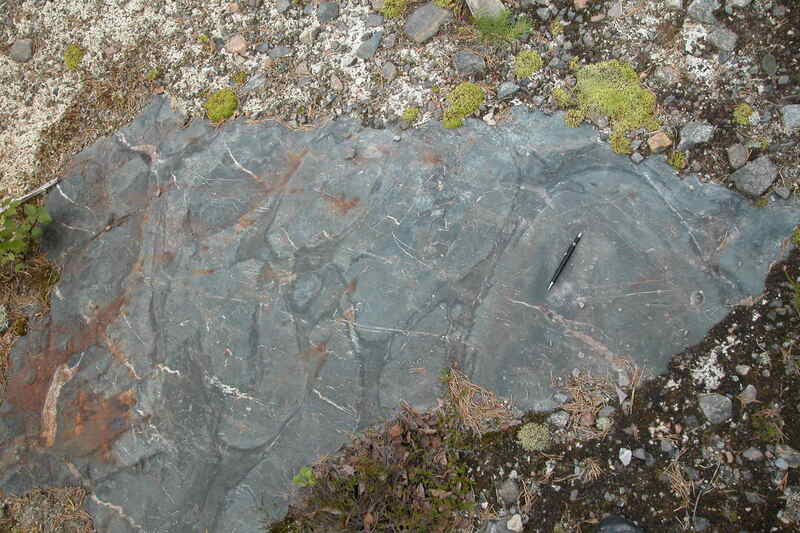 The 2 Ga BIF consists of folded, alternating bands of gray specular hematite (Fe2O3) and red, iron-stained cherty quartzite (SiO2) often called jasperite. The layering has variously been interpreted to result from alternating cycles of oxic (oxygen present) and anoxic (oxygen absent) conditions in the oceans, where iron was oxidized (to Fe3+) and precipitated to form a red layer and then not oxidized (remaining as Fe2+) to give a gray layer, respectively. One of several theories suggests that the first photosynthesizing bacteria produced the oxygen which oxidized the iron. 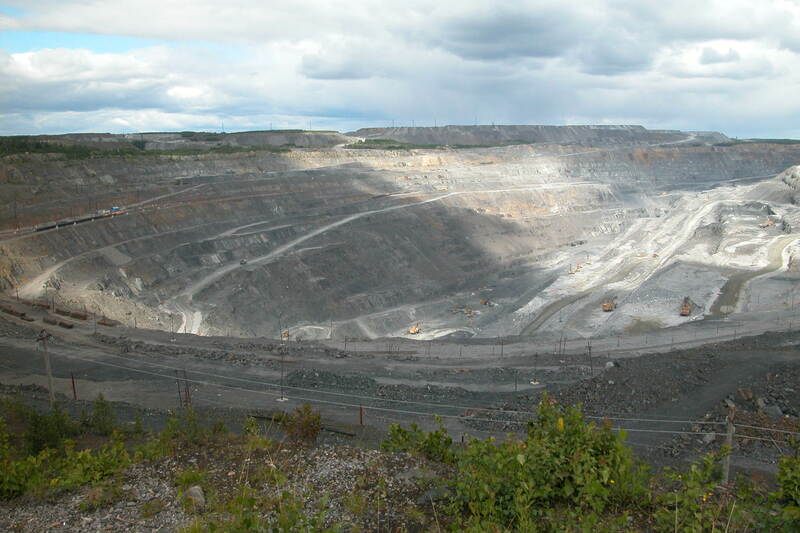 BIFs are often mined for iron ore. FIGURE 28. 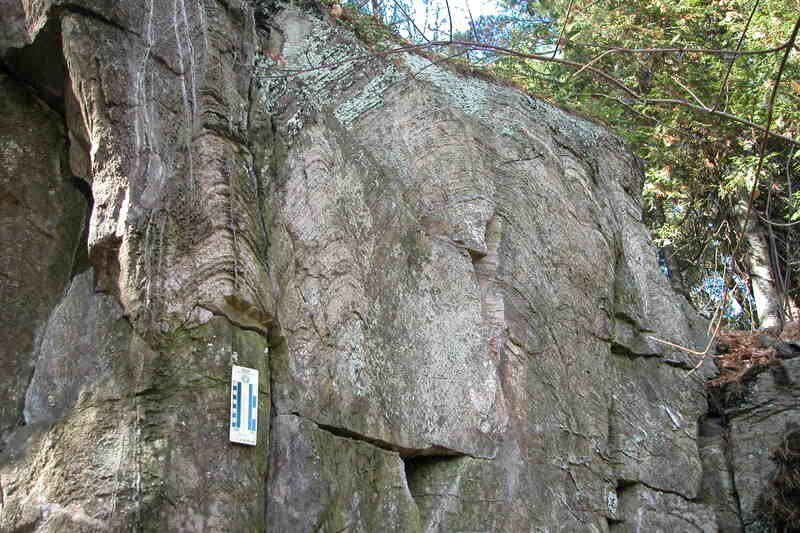 Stromatolites in the 2.2 Ga Kona Dolomite (a magnesium limestone) on US 41 across from the Michigan Welcome Center near Marquette in the Upper Peninsula of Michigan. The domed layering is interpreted to result from sticky mats of cyanobacteria trapping sedimentary particles in a seasonal pattern or as the result of periodic flooding. A second great oxidation event occurred in the late Precambrian, when oxygen built up from 1% to 20%. This may have been due to phosphorous-driven algal blooms or feedback between microbes and clay minerals. The current concentration of 20% oxygen in the atmosphere is ideal: less would not be sufficient for complex, active animals and more would make it difficult to keep fires under control. Evidence for cooling events are found in the Precambrian at 2.9, 2.4-2.2, and 1.4 Ga, but evidence for glaciation is especially prominent near the end during what is called Snowball Earth. 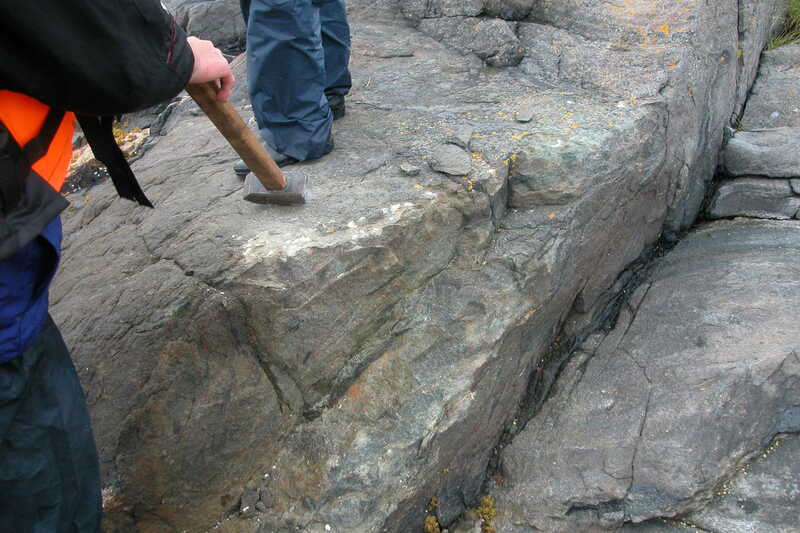 This evidence comes from rocks scratched by glacial movement, moraines of jumbled rocks carried by glaciers, and rocks called tillites that are dropped from glaciers. A seminal paper (Hoffman et al., 1998) called “A Neoproterozoic Snowball Earth” described tillites from the Skeleton Coast of Namibia suggesting that glaciers occurred at sea level near the equator which would indicate that the entire Earth had frozen over. Others have advocated a less extreme version with the Earth not totally frozen over, resulting in a slush ball instead of a snow ball. 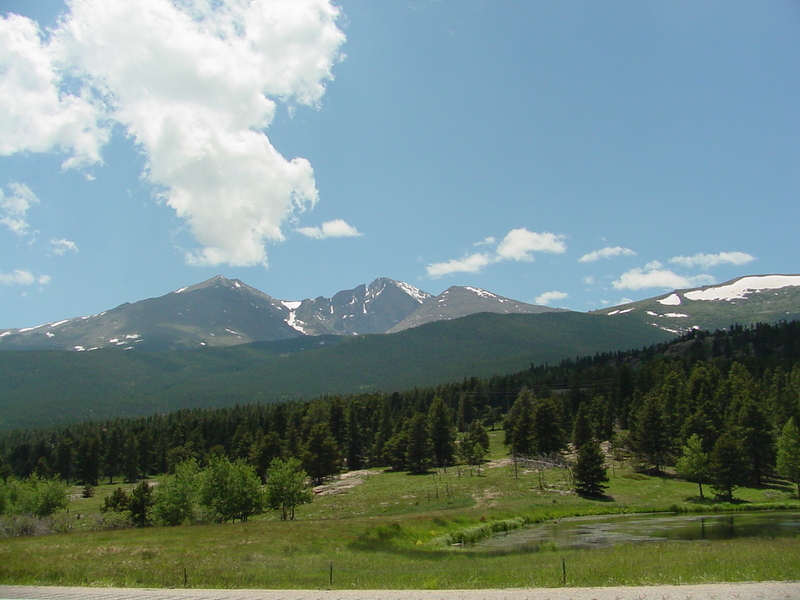 The end-Precambrian cooling events are considered to be part of a cooling/heating cycle resulting from varying carbon dioxide in the atmosphere. The glacial climate resulted from massive blooms of photosynthetic algae that took CO2 out of the air and removed the greenhouse effect. A buildup of white snow and ice reflected the Sun’s heat back into space giving positive feedback to the cooling. The rapid growth of algae concentrated isotopically light carbon leaving isotopically heavy carbon to be incorporated into contemporaneous limestone deposits at 0.79-0.74 Ga. Later when microbial activity slowed down, CO2 began to build up in the atmosphere resulting in a greenhouse effect and causing the carbon isotopes in limestone to become much lighter. These limestones deposited at the end of the glacial cycle and above the glacial deposits are called “cap carbonates.” This snowball/hothouse cycle probably occurred three times around the 0.73 Ga Sturtian glaciation, the 0.65 Ga Marinoan glaciation, and the 0.58 Ga Gaskiers glaciation. In the standard science model (Schopf, 1983; Mesler and Cleaves, 2015), living organisms developed in the Archean with the first evidence for bacteria found at about 3.5 Ga. It is true that complex biomolecules are ubiquitous and are found in hot undersea vents, acidic streams, boiling pools, frozen Antarctic rocks, and stratospheric dust particles. In fact, half of Earth’s biomass lies miles below its surface. The building blocks of sugars, amino acids, and lipids can easily be formed by ultraviolet radiation, or violent ionizing radiation from lightning, or gentler oxidation-reduction reactions. These building blocks can even be assembled into macromolecules. Thomas Gold and others have suggested that methane and petroleum biomolecules may be abiogenic and come from deep in the earth, instead of being produced by living organisms. However, making only right-handed or left-handed molecules is a “daunting challenge” and developing self-replicating molecules is the “greatest enigma.” (Hazen, 2012) It has been variously suggested that organic molecules formed on mineral surfaces, or in a lipid world, or in an RNA world. Although many scenarios have been suggested for developing life from non-life, none are very convincing. The most prominent evidence for life in the Precambrian are stromatolites apparently formed from microbial mats. These concentric geologic structures are interpreted to result from single-celled organisms growing in sheets that catch sedimentary particles upon which the next mat of bacteria grows. Modern day examples of these are found in Shark Bay, Australia. Examples from the Precambrian are found in the bottom of the Grand Canyon (Wise, 2005), in the Upper Peninsula of Michigan (Fig. 28), in southern Africa, and many other places. Evidence for multicellular life is not found until the end of the Precambrian in the 0.64-0.54 Ga Ediacaran (formerly Vendian) period. Soft-bodied fossils displaying symmetrical impressions were recognized from 0.58 Ga rocks in Ediacara of southern Australia. Most remarkable are the 0.63 Ga Doushantuo formation fossils of southern China that display clumps of cells interpreted to be animal eggs and embryos. After the Precambrian, living organisms radiated rapidly in what is called the Cambrian explosion of trilobites, clams, brachiopods, bryozoans, sponges, horn corals, and many other new life forms. One can see the exact layer where this abrupt change from Precambrian to Cambrian occurs in Morocco. The Burgess Shale, made famous by Stephen Jay Gould’s book Wonderful Life (1990), is another prime example of this explosion of life forms. Andrew P. Barth, Joseph L. Wooden, Drew S. Coleman, and C. Mark Fanning (2000). “Geochronology of the Proterozoic basement of southwestern North America, and the origin and evolution of the Mojave crustal province.” Tectonics, v.19, n.4, p.616-629. Martin Brasier, John Cowie, and Michael Taylor (1994). “Decision on the Precambrian-Cambrian boundary stratotype.” Episodes, v.17, n.1&2, p.3-8. J. Fountain (1982). “On the Geology and Structure of the Country around Bulawayo.” Annals of the Zimbabwe Geological Survey, v.8, p.9-20. Stephen Jay Gould (1990). Wonderful Life: The Burgess Shale and the Nature of History. W. W. Norton. Paul F. Hoffman, Alan J. Kaufman, Galen P. Halverson, and Daniel P. Schrag (1998). “A Neoproterozoic Snowball Earth.” Science, v.281, n.5381, p.1342-1346, 28 Aug.
D. Hutchinson (1962). Cambrian Stratigraphy and Trilobite Faunas of Southeastern Newfoundland. Geological Survey of Canada, Bulletin 88. Valdecir Janasi, Silvio R. F. Vlach, Mario da Costa Campos Neto, and Horstpeter H. G. J. Ulbrich (2009). 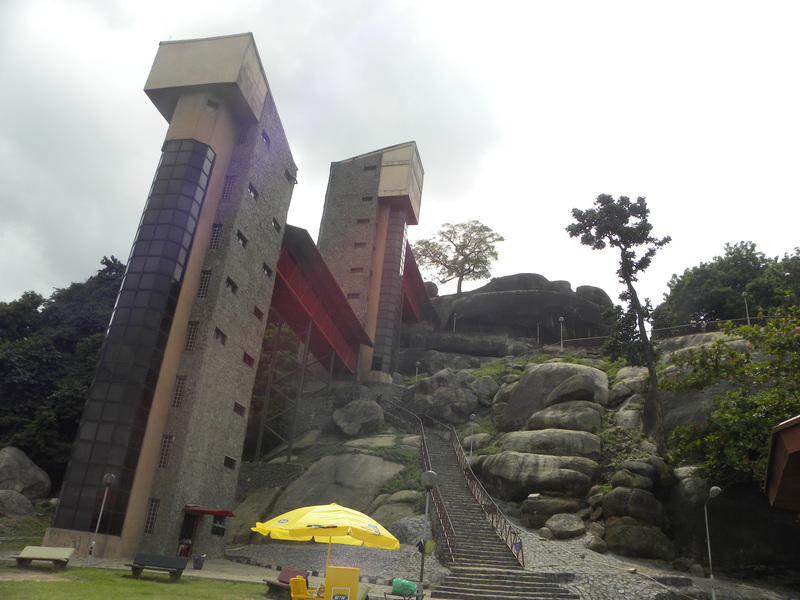 “Associated A-type subalkaline and high-K calc-alkaline granites in the Itu Granite Province, southeastern Brazil: petrological and Tectonic significance.” Canadian Mineralogist, v.47, n.6, p.1505-1526. P. Johnson, B. De Waele, D. Evans, W. Banda, F. Tembo, J. A. Milton, and K. Tani (2007). “Geochronology of the Zambezi Supracrustal Sequence, Southern Zambia: A Record of Neoproterozoic Divergent Processes along the southern Margin of the Congo Craton.” Journal of Geology, v.115, p.355-374. Yong-Joo Jwa (2005). “Possible source rocks of Mesozoic granites in South Korea: implications for crustal evolution in NE Asia. IN: S. Ishihara, W. E. Stephens, S. L. Harley, M. Arima, and T. Nakajima, eds., Fifth Hutton symposium: the origin of granites and related rocks: Geological Society of America Special Paper 389, p. 181-198. Alex Kisters, Charlie Hoffmann, and Rob Ward (2007). “FT1 Pre-conference field trip to the Pan-African granites of the Damara Belt, Namibia.” 6th International Hutton Symposium on the origin of granites and related rocks, 24-29 June 2007, 51p. S. Lovering and Ogden Tweto (1953). Geology and Ore Deposits of the Boulder County Tungsten District, Colorado. U. G. Geological Survey Professional Paper 245. Vincent Matthews, Katie KellerLynn, and Betty Fox, eds. (2003). Messages in Stone: Colorado’s Colorful Geology. Colorado Geological Survey. Terence McCarthy and Bruce Rubidge (2005). The Story of Earth & Life: A southern African perspective on a 4.6-billion-year journey. Struik Publishers, a division of New Holland. Bill Mesler and H. James Cleaves II (2015). A Brief History of Creation: Science and the Search for the Origin of Life. W. W. Norton. Jean-François Moyen, Gary Stevens, and Alex Kisters (2007). 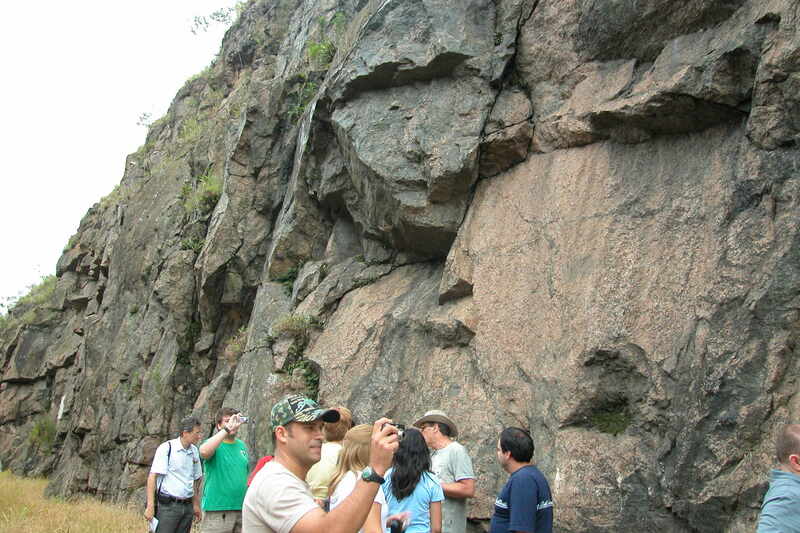 “FT2 Post-conference field trip to the Mesoarchaean Barberton Granite-Greenstone terrain.” 6th International Hutton Symposium on the origin of granites and related rocks, 7-12 July 2007, 168p. Guy M. Narbonne, Paul M. Myrow, Ed Landing, and Michael M. Anderson (1987). “A candidate stratotype for the Precambrian–Cambrian boundary, Fortune Head, Burin Peninsula, southeastern Newfoundland.” Canadian Journal of Earth Sciences, v.24, n.7, p.1277-1293, 10.1139/e87-124. Petri Peltonen, Pentti Hölttä, and Alexander Slabunov (2008). “Karelian Craton transect (Finland, Russia): Precambrian greenstone belts, ophiolites and eclogites.” 33rd International Geological Congress excursion No 18, July 28 – August 4, 2008, 131p. William Schopf, ed. (1983). 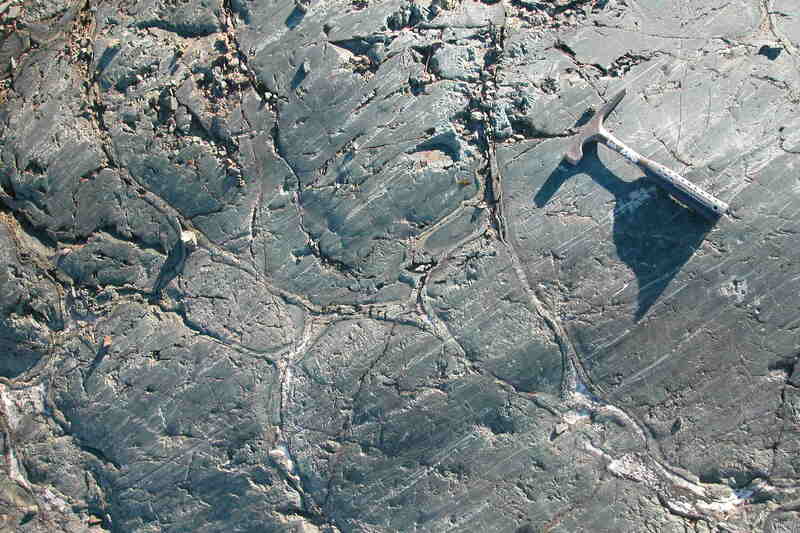 Earth’s Earliest Biosphere: Its Origin and Evolution. Princeton University Press. Thomas Schlüter (2008). Geological Atlas of Africa. Springer. Schmitt (1978). “Stromatolites from the Tiout Section, Precambrian-Cambrian boundary beds, Anti-Atlas, Morocco.” Geological Magazine, v.115, p.95-100, March. Andrew A. Snelling (2010). “The Geology of Israel within the Biblical Creation-Flood Framework of History: 1. The pre-Flood Rocks.” Answers Research Journal, v.3, p.165-190. Kurt P. Wise and Andrew A. Snelling (2005). “A Note on the Pre-Flood/Flood Boundary in the Grand Canyon.” Origins, n.58, p.7-29.